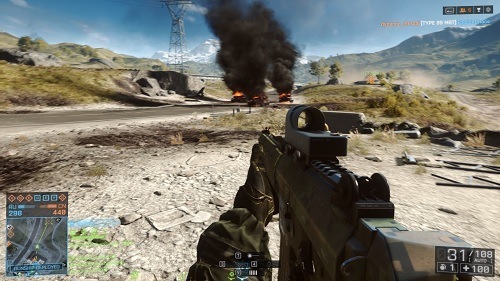 Battlefield 4 continues the Battlefield series with impressive first person shooter gameplay in both the single and multiplayer environments. The game was one of the first titles available for the new generation of consoles (Xbox One and PlayStation 4). The games story takes a small step into the future and is set in 2020 as tension between the world’s largest nations reaches a new peak. The game is set in the same universe as the previous game with some returning characters and references to previous events. This time around players will tackle the campaign in chronological order through the eyes of Sgt. Daniel Recker who belongs to a Special Forces unit of the United States. Players familiar with first person games will recognise the usual culprits during gameplay with your HUD displaying your map, health and current ammo status. The map provides all the information you need on your current objective and also shows allies and enemies much like most other games. Weapon variety is very impressive in the single player campaign and expands to even more options in the multiplayer environment. Some of the more basic vehicles are also used in the campaign although the majority are reserved for online play. The series continues to focus on a more squad based experience in the multiplayer environment with success coming from a team working together rather than a few star shooters like in the Call of Duty franchise. Class systems, spotting and vehicles continue to be staples of the online gameplay in Battlefield 4 while the commander mode lets you step away from the battle to help direct your team to victory by issuing the orders and supporting them when possible. Battlefield 4 has plenty of fast paced and tense moments during both the campaign and multiplayer that make it a highly desirable purchase for FPS fans. Another game in the Battlefield series. Breath-taking visuals help take realism to the next level. Good length campaign set in the near future. Same squad based approach to gameplay as previous games. 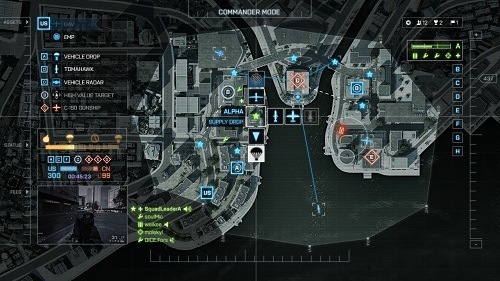 Commander mode lets you oversee the battle and direct your team to victory.